With the first phase of General Elections 2019 over and the second knocking at the door, the political atmosphere in the State is obviously charged up. BHUBANESWAR: With the first phase of General Elections 2019 over and the second knocking at the door, the political atmosphere in the State is obviously charged up. And what better way to have a measure of the mood of voters in the State than the general compartment of a passenger train. Sunday being a holiday, finding sitting space in the Bangirposhi- Bhubaneswar Express, the preferred train of daily commuters to the Capital City, is not much of a problem. As it departs Balasore at around 6.55 am, the compartment is moderately filled up and there is the expected buzz over politics. From loud whispers to animated discussions, the mood is all about elections. Close by, the co-passengers are debating the selection of candidates in Mayurbhanj and Balasore districts and counting the development or lack of it in their areas. Grabbing the small paper cup of steaming hot tea from the Chaiwalla, a middleaged Sudhakar Behera from Betnoti said he would this time support the party which has undertaken development in the area. “Our village is now connected with a wide black-topped road and the lanes inside the village have been replaced with concrete roads. We have a new school building and piped drinking water facility. All have been done in the last five years,” the accountant in a Bhubaneswar- based private firm says. He, however, is unhappy over the selection of candidate of the ruling party for Badasahi Assembly segment he belongs to. BJD has dropped sitting MLA Ganeswar Patra and fielded Brundaban Das, who had unsuccessfully contested 2014 election on BJP ticket and was defeated by Patra. Another passenger Prabir Mohanty, who boarded the train from Balasore, butts in saying development is a continuous process, but defence of the country is paramount. People for the first time realised that India too can enter the enemy country and kill terrorists. “My vote is for the party which keeps national security and nationalism at the top of its agenda,” a visibly charged up Mohanty intervenes. As the train approaches Bhadrak, a couple appears to be restive. With problems of their own, they are least interested in the political discussions around them. Introduced as Dukhishyam Bindhani and his wife Kabita from Jugpura, they are going to Cuttack for getting medical help for the latter, suffering from gall-bladder stone. When asked why Cuttack when they have two medical colleges at Baripada and Balasore, Dukhishyam says, “Ki medical college babu, sabu bibhaga re daktar nahanti (which medical college babu, there is dearth of doctors in most of the departments)”. The couple said they are still undecided for whom they would cast their votes. “Let’s see. We don’t know whether we can vote if the doctor plans surgery during that time,” he added. Not only for the Bindhani couple, the train is a lifeline for many from Mayurbhanj and parts of Balasore as it ferries large number of patients to Cuttack who either report at SCB Medical College and Hospital or consult private nursing homes. 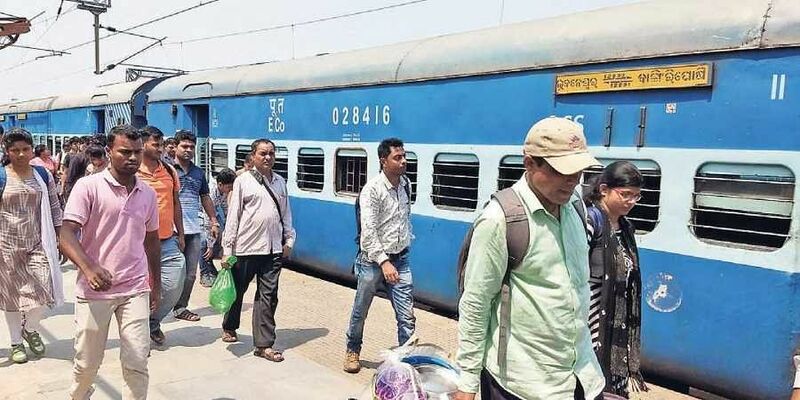 But come elections, negligence by railways becomes a poll issue as Mayurbhanj is one of few districts in the State which is not well connected by rail network. Before the train halts at Jajpur Road, a group of labourers get ready to alight. They work at a construction site there. Even as political heat grips the entire State, for them it is their work which is important for living. But they still make their choices clear. While the younger ones in the group cheered for Modi and said their vote is for ‘phula’ (BJP’s symbol lotus), the middle aged expressed their preference for Naveen stating that he has given them house, rice at `1 a kg and other benefits. By the time the train reaches Bhubaneswar, it was almost half empty as most of the passengers got down at Jajpur Road and Cuttack.